For most people spring is the most exciting time to be a gardener, with new life springing from the branches of trees, azalea blooms lighting drab bushes aflame with pink and purple, and dogwoods lighing up the woods and old neighborhoods. Up north its a more drastic contrast with bulbs poking through the melting snow and whole forests turning vivid green in a matter of days. Fall on the other hand has traditionally been seen a season of explosive decline with trees preparing for winter by flashing bright ochres, crimsons and scarlets before coating the ground with a blanket of orange. While we still do get some fall color in North Central Florida from the sycamores, red maples, crape myrtles and so forth, the colors aren't as bright and the effect is drowned out by the many evergreens and plants still in full bloom. Fall is my favorite season in Florida. Not for the "fall color" but because of the tropicals in their prime, blooming like theres no approaching winter to wory about! At the same time native plants such as goldenrod and beautyberry choose this time to spread their pollen and seeds, so they fill roadsides, woods and gardens with their rich hues. Walking the roads of my oak shaded neighborhood I find new surprises every year as well as plants and gardens I know to return to, such as a massive azalea hedge that gets covered with the rambling tendrils of an african climbing lily called "glory lily", with its upward pointing petals looking for all the world like fiery comets plummeting into the deep green leaves of the azalea. Arching out from the base of a live oak is a massive "firespike", luring hummingbirds with crimson red spikes shooting up from its canopy. The texture is coarse with 9' glossy leaves, looking even more impressive after a rain with droplets of water clinging to the leaf tips and tubular red flowers. Foliage plants are in their prime as well, having had the sufficient time to recover from winter and now enjoying moderately warm weather. A golden pothos cloaks the upper reaches of an oak with its huge 2" variegated green and yellow leaves in a nearby backyard. The vines trunk is now the width of my arm, as this vine's size is direcly related to how high it is climbing and in what direction. Huge when climbing up a tree, the vine reverts back to the more familiar houseplant sized leaves when they drape back down. Bananas are really taking off now, and the philodendrons are in their element. 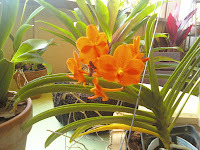 On the balcony, my vanda orchid is flaunting its bright orange flower cluster to the swimmers in the pool downstairs, and it will soon be accompanied by the 3 foot tall yellow flowerspikes of my dancing ladies orchid. One spike is about to open while the other is just now emerging from the base, ensuring months of color from the plant I acquired in bad shape for $5 in spring. Some tillandsias hanging in a ball are also starting to bloom, so will complete a wonderful view from the living room. Back at my parent's garden every plant is dotted with baby treefrogs, as well as bright green anole lizards. Butterflies float by and hummingbirds zip around the flowers while neon colored dragonflies vigilantly protect us from mosquitoes. The Chaemadorea palms out front are flowering and fruiting with bright red oval berries that look very much like the coffee berries out back, and phillipine ground orchids grace the front of the palms with dainty purple sprays of flowers. Nearby the neoregelia bromeliads are starting to pup (grow new bromeliads) and I can soon divide them. In the side yard the tabebuia now towers over the firespike and firebush, while morning glories, black eyed susan vines and seedling passionfruit vines weave their way through. The butterfly palm gacefully arches its fronds from a purple princess flower, and nearby a new planting of rajapuri banana and philodendrons settles in. The australian treefern is growing prolifically with a new frond every week and now sports a 6 inch trunk after just half a year. Towards the back of the garden the hidden gingers are now taller than me and will soon show its soft pink flower bracts along with the neighboring pinecone ginger's bright red inflorescences. In the corner a monstera deliciosa (swiss cheese philodendron) rambles through a stand of butterfly ginger that are going to light up the night with fragrant flowers bright as moonlight. Mingling with the rubber ficus, the turks cap hibiscus is about to hang its bright red flowers down to invite hummingbirds and painted buntings in to indulge in nectar. Yes there will be "fall foliage", but whats so great about fall around here is knowing that most of these wonderful sights will continue right into winter, stopping only after Christmas. Even then we'll have tangerines and poinsettia bushes to enjoy, not to mention the plants you had the foresight to bring in for the winter to cheer you up when fall has finally ended.